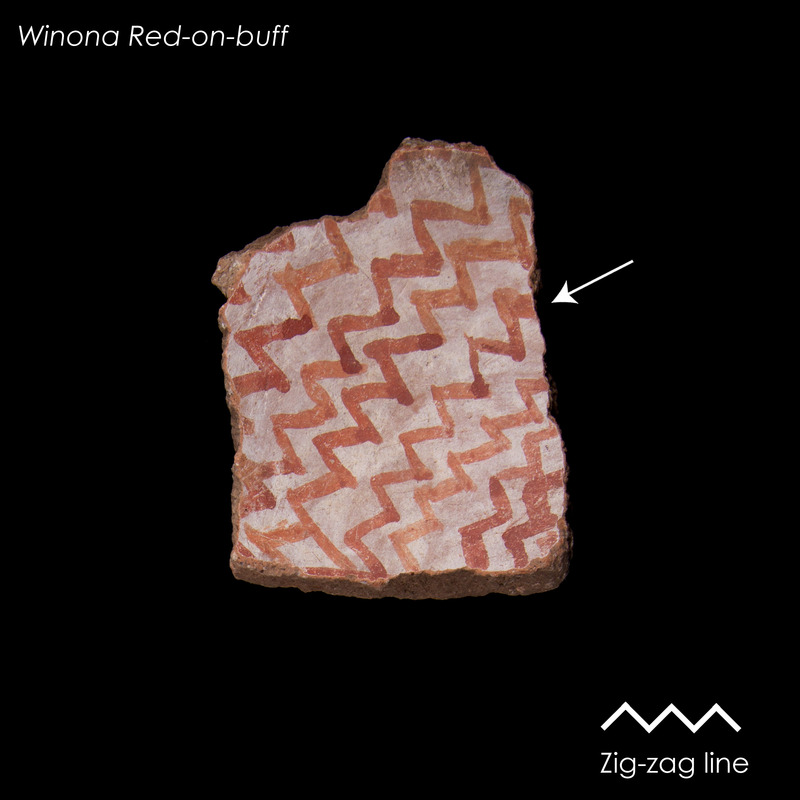 Winona Red-on-buff sherd with zig-zag line elements. Click the image to open the Winona Red-on-buff gallery. Like Coconino Red-on-buff, Winona Red-on-buff is a type of Coconino Buff Ware reminiscent of Hohokam Buff Ware pottery made in central and southern Arizona, but limited in distribution to the Walnut Canyon area of northern Arizona. Firing: In a oxidizing atmosphere. Core Color: Black, gray, or buff, tending to brick-red near the outer surface (jars), or brick-red. Temper: Abundant coarse light-colored angular fragments (gray, white, or buff) (Variety 1), or abundant grains of black volcanic sand (Variety 2). Surface Finish: Interior surface generally anvil marked and unpolished; exterior surface impacted, sometimes scraped, and frequently wiped. Surface Color: Exterior (jars), reddish-brown to light buff; interior (jars), dark gray, buff or reddish-brown. Paint: Bright red, dull red or purplish red. Design: Elements consist of serrated barbs, thin parallel lines, often wavy or jagged; fringe attached to lines; hatching, with the hatching areas often doubly capped with jagged lines; both rectilinear and curvilinear scrolls. Comparisons: Types of Hohokam Buff Ware all have different temper. Coconino Red-on-buff differs in that it definitely has a slip. O’Hara, Michael. (1998) Red-on-buff North of the Mogollon Rim: A Comparative Analysis and Cultural Assessment. Masters Thesis. Northern Arizona University. Flagstaff, Arizona.